The hop-on hop-off buses in New Zealand operate nationally. 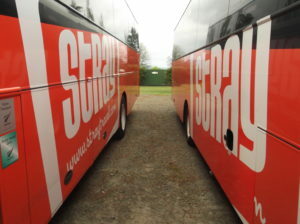 There are two fantastic hop-on hop-off bus operators, Stray and Kiwi Experience. The passes are totally flexible so you can jump on or off the bus anywhere you want along the way – to stay longer, visit friends or even work for a while. 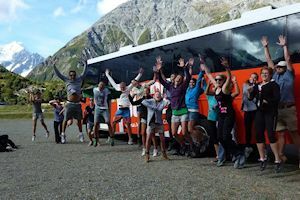 If you are short on time, you can also use the hop-on hop-off bus like a tour and complete your pass in minimum days while still enjoy outstanding locations and unique attractions around New Zealand. You can relax while your driver books your activities and accommodation for you, or be independent and do your thing. 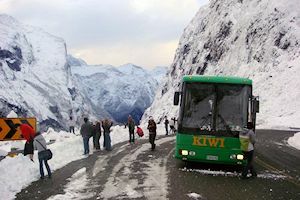 Land transport around New Zealand, guidance and commentary from your driver guide (they book your accommodation and activities), access to special deals, access to expert local knowledge on the best things to do in each location the bus stops at. 2 – Where can I hop on and off? You can get on and off the bus anywhere on the route, as often as you like, so long as you verify your trip changes online or with the reservations team. You can’t hop off the sectors run by other transport providers i.e. Paihia – Cape Reinga – Paihia, and Christchurch – Greymouth sectors (applies to both hop-on hop-off companies). Overnight destinations are shown as a bold dot on the buses’ maps (with the name clearly beside it), whereas places of interest or activity stops are normally in a smaller dot. You need to update your plans on the bus companies’ online booking system or by contacting their reservations team after any changes, to ensure that your seat is confirmed. 3 – How long is my pass valid? All passes are valid for 12 months and with unlimited travel can be used as many times as you like, travelling in one direction around New Zealand. Make sure to read the fine print for both Stray and Kiwi Experience. But we do go through them with you should you decide to book a pass with us. 4 – Is accommodation included? Your driver guide organises beds in stopovers and guarantees you accommodation for the minimum travel days in each place – even in peak season (which can be invaluable). You are given a choice where available – there is always an option at backpacker hostel rates (about 28 per night), and usually twin and double options to hotel standards from about 75 per couple. You simply pay for your accommodation as you go. Note: Cultural overnight stops can be an exception with a higher all-inclusive price. 5 – Where do we stay? Accommodation ranges from backpacker hostels (VIP, BBH, Nomads, YHA) to wilderness lodges. Your driver will book your accommodation for you. If you want to choose your own hostel, tell your driver as they might be able to drop you off at a different hostel. 6 – What do we eat? You can self cater (buses make supermarket stops) but there are cheap meals (often with local specialties), available at all stops – there is always a vegetarian option. 7 – What activities do we do? Your driver gives you guidance and information about the local culture, history and wildlife of each location, and each day will try to offer a number of activities for you to choose from with free or paid options. 8 – How many people will be on the bus? The average group size is around 30 but this can double in summer with more buses being provided to accommodate numbers. However, you don’t feel herded around. 9 – Are we travelling every day? There are some free days (non-travel days) in some key locations, so even if you’re on minimum time you’ll be able to do activities and explore each of these areas. Bus network will guarantee your accommodation for two nights in each of these locations with “free days”. 10 – Who travels on the hop-on hop-off buses? Most hop-on hop-off travellers are between 20 and 30 but we get younger and much older too! If you’re keen to meet other travellers, prepared to be active (the tours can cater to various fitness levels), push your limits and get involved in the local culture, then jump onboard! There will likely be a few drinks at the end of a day full of adventure. 11 – How do I book on and off a bus? On Stray, you can book back on a bus online via the ‘Login’ button located in the main menu of their website or by phoning their reservation team. 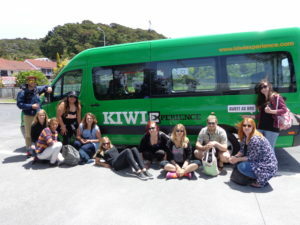 For Kiwi Experience, book with their reservation team over the phone. In peak season (especially January and February) you should book your seats at least a few days in advance to avoid disappointment.